Girl Scout Journey Award Set is iron-on with three embroidered circles with the words: "Energize, Investigate and Innovate." Imported. 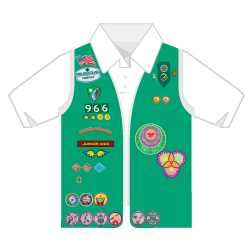 Girl Scout badges, awards and other insignia that are earned for the accomplishment of skill-building activities or any set requirements should be presented, worn, or displayed only after Girl Scouts have completed the requirements outlined in the appropriate program materials.